Ready for some Footy?? 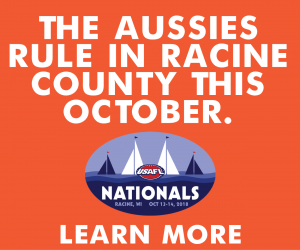 That’s the nickname for Australian Rules Football, and the US wing of the Aussie League is bringing the Australian Football National Championships to Racine County! This is the world’s largest Australian football tournament, taking place October 13-14, 2018 at the Soccer Complex of Racine (SCoRe) in Franksville, just northwest of Racine proper. Australian Football (nicknamed “Footy”) has some significant differences with American Football. The field is oval-shaped and about twice the length of an American football field. Teams of 18 players can move the ball using any parts of their bodies. They’re not wearing the football pads and uniforms that American football players do – they dress like soccer or rugby players. Any player can score by kicking, hitting, or running the ball through the goal. Aussie Football games consist of four 20-minute quarters, time continues to roll and more time is “added on” if play is delayed – similar to soccer – and players can move freely around the field and sub in or out at any time. Oh, and a player advancing the ball must bounce the ball or touch it to the ground every 15 meters. So in a sense, there’s a basketball move involved in this too. Get more details on Australian Rules Football here. The USAFL (United States Australian Football League) governs the sports in the US and sanctions men’s and women’s competitions among over 35 clubs across the country, with over 2,000 players participating. About a dozen of these teams have advanced to play in this championship tournament in Racine County; teams from Houston, Denver, Minneapolis-St. Paul and more will be descending here to compete for it all. Matches start at 9am Saturday, October 13th; finals are scheduled to begin around 5:30pm. Spectator admission is FREE! You’ll find the SCoRe complex just off County K between I-41/94 and Highway 38 in Franksville. It’s about two miles north of Highway 20.